I always get excited when some local joints get some national recognition. While not all have panned out to be something special, enough of them have to make the adventure more than worthwhile. Recently Flip Side Burgers in Hudson made the burgers episode of Unique Eats of the Cooking Channel and we finally had a chance to get to Hudson. Hudson really isn’t on the way to anything but there are enough local eateries who have garnered enough local and wider high praise that it may be a destination of ours for a bit. Sunday just after noon was a great time to go as there is apparently a line out the door most days and by the time we left all of the tables were full and the line was forming. 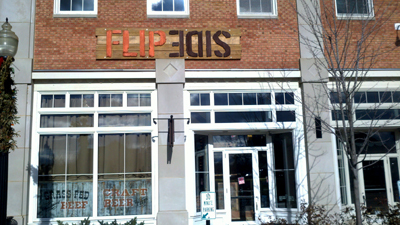 Flipside uses local grass fed beef. Our server was one of those guys who seem to be made for hospitality although he seemed close to overwhelmed as the small dining room filled up. The staff puts in a real team effort on the floor but they may well have been understaffed when things really got rolling. The space itself is one of the most unique decors; it certainly wasn’t modeled after any other place I have been in. 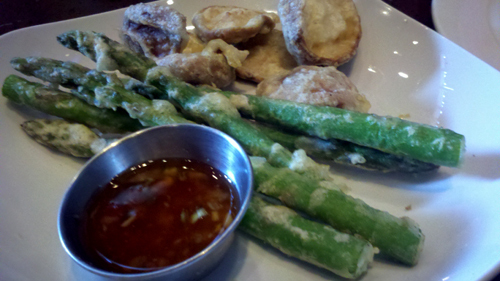 We started with tempura fried shrooms and asparagus (burger place?) and their house made chips. The shiitakes and spears were pretty good but became really good when immersed in the scallion chili sauce that comes alongside. 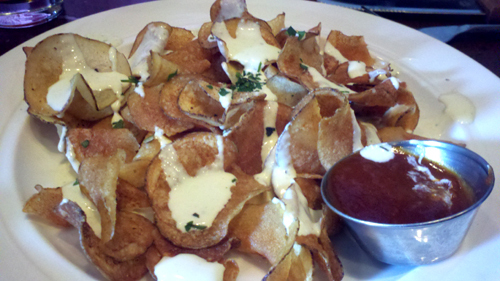 The chips are dressed with a bleu cheese yogurt sauce and came with a little cup of hot sauce. The sauce on the chips was more yogurty than blue and was fine. What I really found interesting was the hot sauce which blended a nice kick with a familiar tanginess that I couldn’t quite place. Together with the thin crispy chips and the yogurt…it was fantastic. We tried the simplicity burger, the black and blue burger, the Colorado lamb burger and the corn dogs with an order of fries. 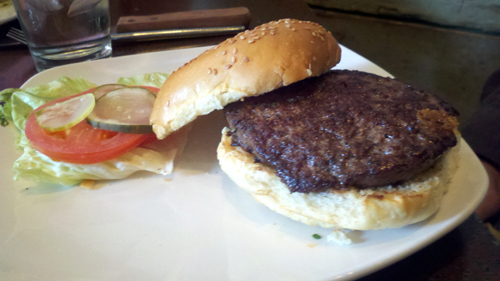 The simplicity burger was reportedly tasty and eclipsed the Rail burger from our stop a week ago. 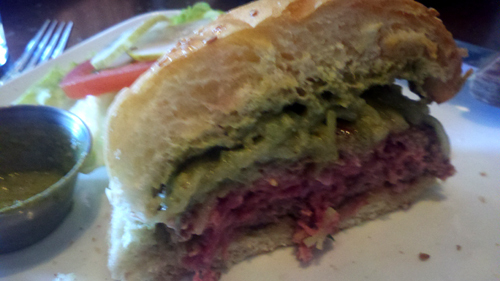 I ordered the lamb burger which was the only real disappointment for me the entire meal. 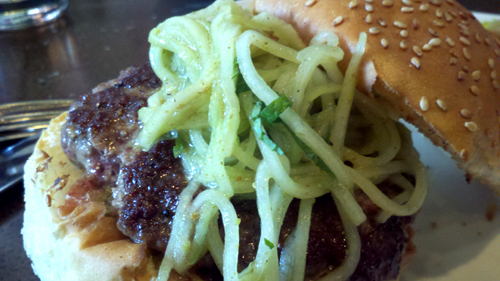 The menu describes it as a curry burger with Jamison Farm Lamb, a curry yogurt sauce and a cucumber-mint slaw. What it was is underwhelming in every regard. Lacking the flavors of lamb, curry, really anything, it was more disappointing after the bold bites of the appetizers and everything else on the table. 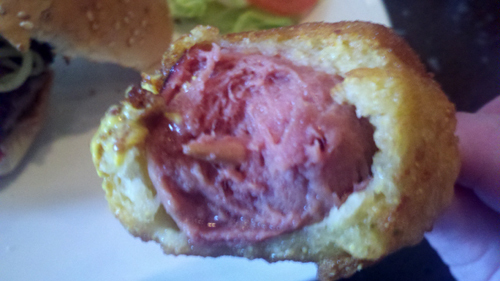 The corn dogs are fashioned from Kobe Beef and ooze the tasty proof of their flavor (fat) content. 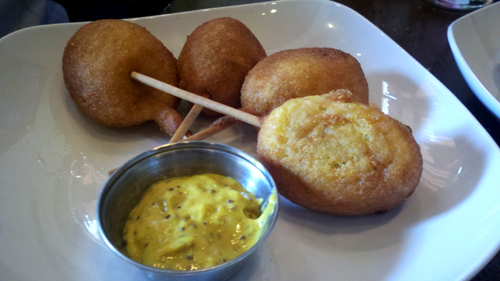 They look a little more like dog “pops” than a traditional corn dog. Fried in a sweeter corn crust than most I have had, the sweetness is cut by the three mustard sauce that is served with it. A really nice combination. 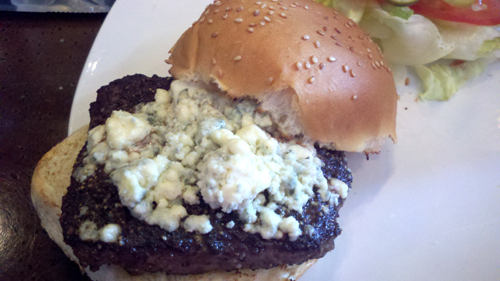 The best thing I tried was the black and blue burger that had a nice dose of blue cheese but was really outstanding due to the blackening seasoning on the exterior of the patty. Spice laden pepperyness pervaded every bite. This was the level of wow I was hoping for with the lamb. The fries are done in the manner of all uber serious frites creators. Three separate fries result in a potato that is downey soft in the center with a dark crispy crunch on the outside. Being an uncouth American, I like a dousing of Heinz on most of my fries but these were better without; and even better with a splash of the dusky malt vinegar on the table. 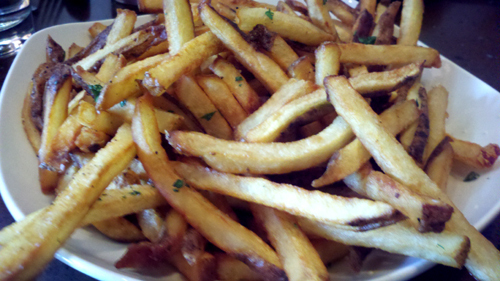 Perfectly seasoned and dusted with a pinch of greenery, the fries were great! We thought about trying the fried apple pie but we had shared a shake while eating and just couldn’t do it. 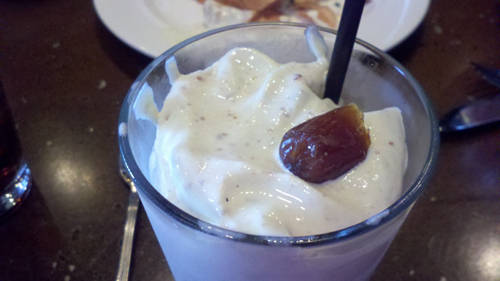 We left satisfied though as the shake was concocted with high quality vanilla bean ice cream and studded with Medjool date pieces. My first date shake, probably not my last. They have a number of other ice cream offerings that I am looking forward to trying. I wouldn’t make a special trip to The Rail for a burger. I may very well travel twice that far for another sampling of Flipside. Just not the lamb burger.